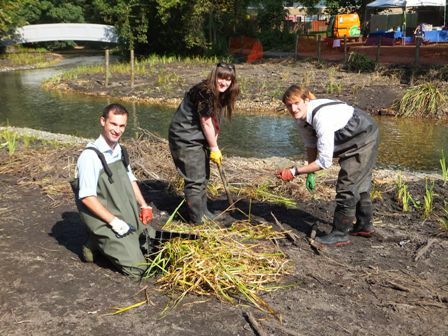 In the past few weeks we have had three new members of staff join the Wandle Trust & SERT team. Polly Bryant joins us from Norfolk County Council and will be running our volunteer events; Luke Mitchell, who has been undertaking research on the River Stiffkey in Norfolk, will be working on river restoration projects – you may well bump into him in Ravensbury Park; and Olly van Biervliet, previously at Norfolk Rivers Trust, will be picking up our water quality projects from Claire. Within half an hour of arriving at the Trust, Polly, Luke and Olly were already getting stuck into our river restoration work at Hackbridge! Luke, Polly and Olly get stuck in! This entry was posted in Uncategorized and tagged People, River restoration, Wandle on September 10, 2014 by Bella.